After modelling the 1/32 Revell kit of the F-14 more than 10 years ago as model converted into a F-14D, my modelling friend Bas gave me an old Tamiya F-14A kit. This classic kit has kit.no 60301 and dates back from I guess 1982 so over 30 years old!! 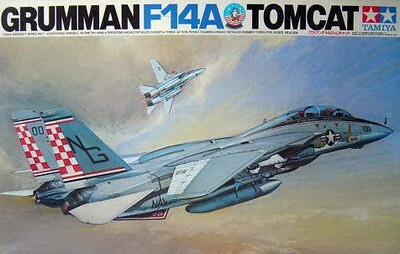 To my knowledge, it was the first 1/32 Tamiya kit of an aircraft and it was a spectacular release. The model has a good outline but it was in those days far too expensive for me to buy as a kid. 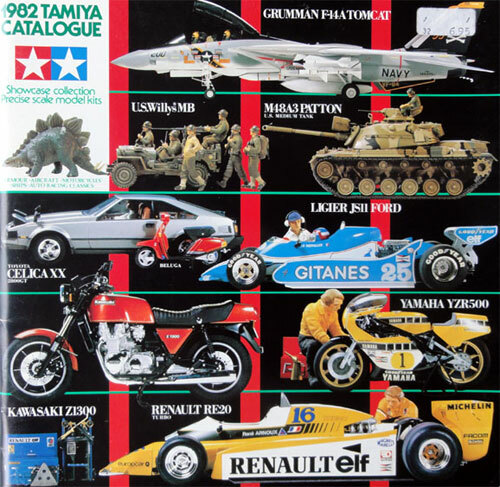 But I always was excited seeing it in the famous Tamiya Catalogue and was very anxious to get one! When it first appeared this Tamiya kit had simple seats, decals as instruments and rubber tires. But it had a combination of raised and engraved panellines. Very nice were the metal spar for strength, the armament with Phoenix missiles (only carried by the F-14), a set of simple Sparrows and old style Sidewinder missiles. Later the kit was upgraded by Tamiya (e.g. 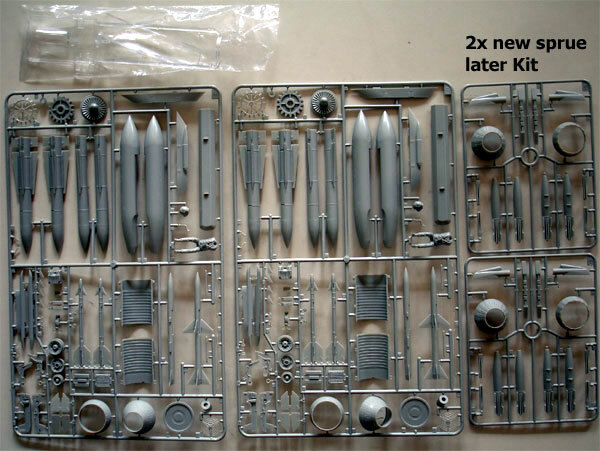 kit no 60303) and it got a couple of new parts, such as the "H sprue" with the later style nosepod and ECM blisters on the airframe. 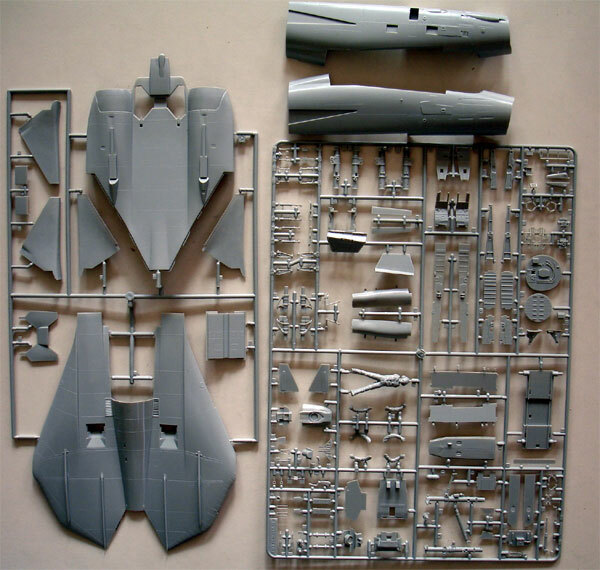 The old kit would be assembled further and as I did not have old F-14A kit assembly instructions, those of the later kit were used so obviously some tiny differences are there. 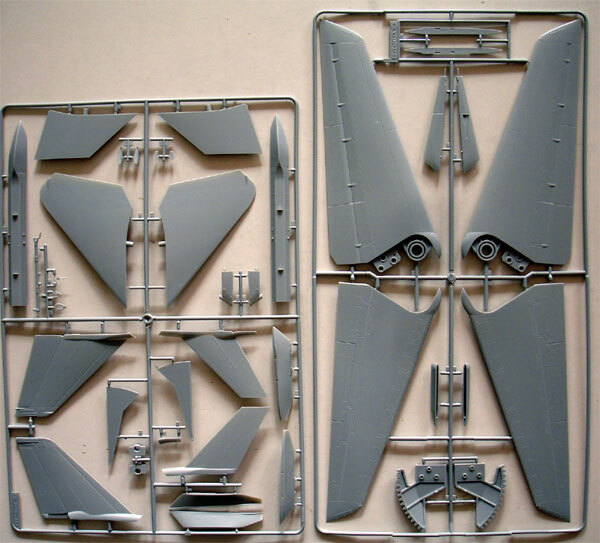 In the box of Bas I found also a very old Model technologies etched metal set for the inside canopy frames with locking details as well as no less than 3 Microscale 1/32 decals sets (although not complete). Also an extra couple of old Tamiya decals were inside although very "yellowish". 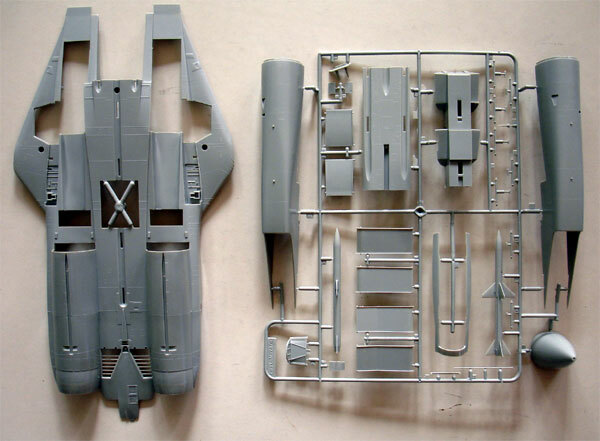 Checking the spares box, I also had a spare Revell 1/32 F-14 decalsheet (as on Revell page 1). So enough goodies to make a nice model! 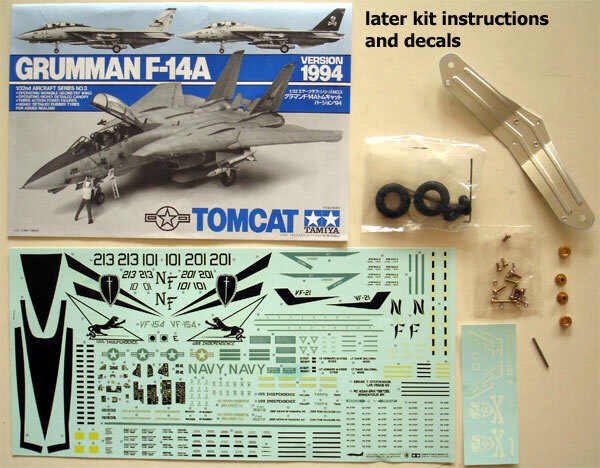 Using an old Microscale decal set 32-46, it was decided to make an F-14A Tomcat of US NAVY VF-24 as based on USS Constellation with the old first Gull grey-White scheme. 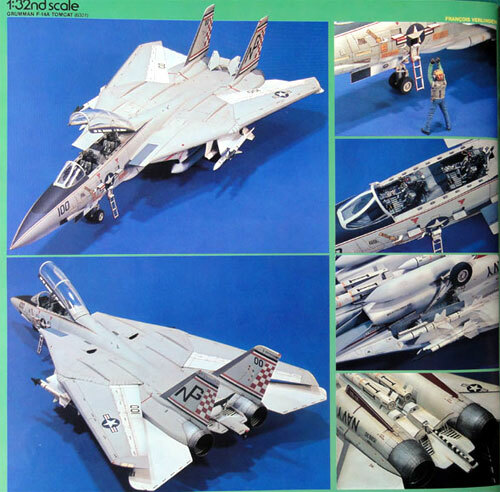 VF-24 received the F-14A end 1975 and in 1977, 1978, 1980, and 1981 they operated from USS Constellation as part of CVW-9. 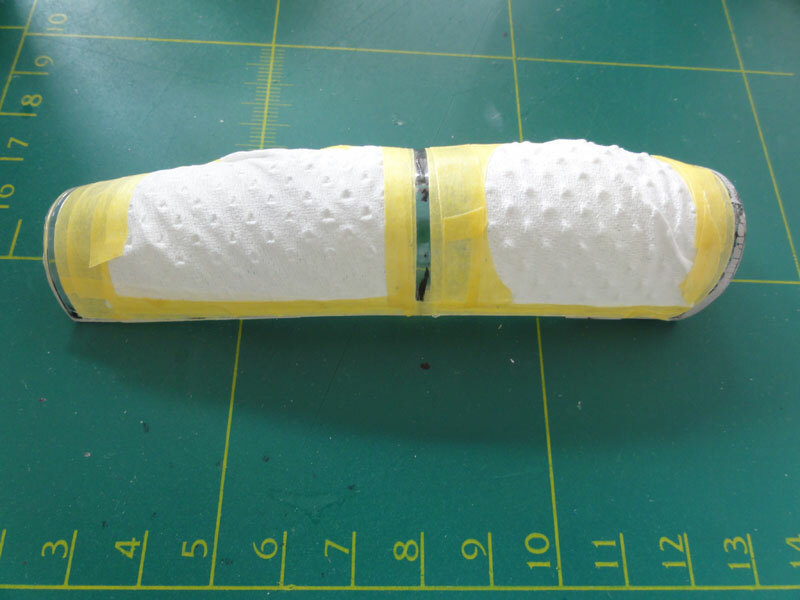 The basic kit assembly was already started by Bas as per kit instructions. Some gaps were filled and particularly the forward-rear fuselage joint requires putty and sanding. The radarnose was set closed. So kit instructions STEPs 1 up to 10 were completed but without woorying at thus stage about cockpit detailling. Some further putty and sanding was needed at the horizontal stabilizers and vertical tails. The intakes are nice and in STEP 9 the inside air intake airramps are very nice. The kit seats are very simple, so I got a couple of QuickBoost resin seats (set no. 32033). I also bought an EDUARD cockpit instrument plackard set no. 32023 with self-adhesive pre-painted instruments. The canopy had some irregularities IN the plastic, there is not a lot that can be done about that. The canopy scratches were removed with a nail polish set (in the Netherlands these were found in ACTION stores). (The canopy will be dipped in Johnson Future later). The model got all gaps and irregularities puttied and sanded and was ready for a first paint coat of light grey to check for any flaws. After correcting any appearing mishaps, the next paint was an overall White to all lower surfaces, gear doors and the upper wing flap areas, rudders and horizontal stabilizers. A spray can of white was used (such as from Halfords). Subsequent white areas of Fed.Std FS36875 got a coat of acrylic Revell Aqua 301 white with my Harder Steenbeck airbrush. Note that the Revell Aqua acrylic paint is better thinned with the original Revell Aqua Thinner , the "light blue" marked bottle (so not water). When dry, the lower white demarcation line was masked off with low tack masking tape as well as the flaps, and rudders. On the top fuselage, some "black" stripes were airbrushed to suggest weathering undercoat ("pre-wash"). Next the Fed.Std FS36440 gull grey was airbrushed on top using Gunze Sangyo H325 Gull Grey acrylic paint. Above the slightly different gull grey colours are seen due to the "pre-wash" black undercoat stripes. On the clear canopy G4 also the tiny frame on the edges was masked as well as the canopy support frame part B15. After getting the gull grey frame, the canopy was dipped in a Johnson Future/Pledge "bath" to get a clear gloss sheen. Let the surplus Future drip off the canopy on a paper towel to get an even coat. Inside the canopy frame B15 the Model Technologies locking etched metal details were fitted. These insides will get a dark grey/black coat. After drying, next steps of assembly were done. STEP 11 shows the nose gear assembly which is very nice. I only added a few hydraulics tubing/wires made from stretched sprue. 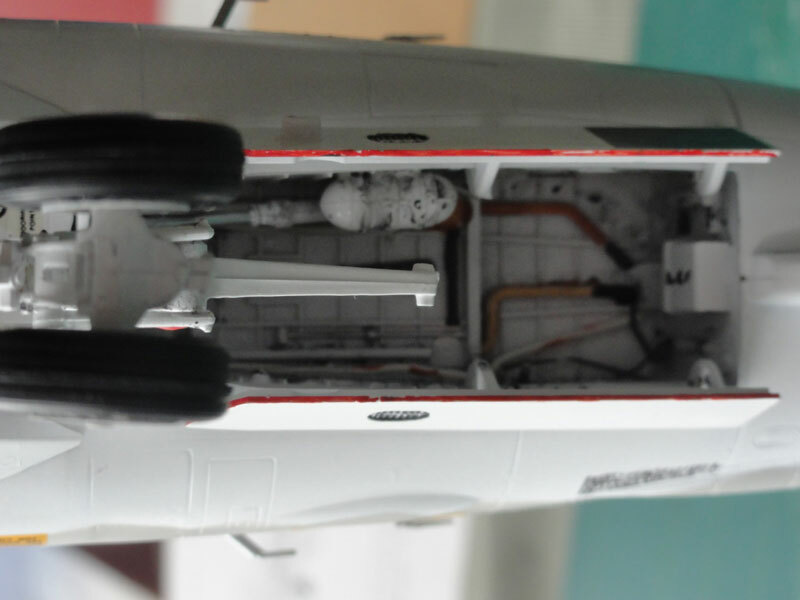 The nose gear bay got extra detail as well made from stretched sprue and other bits and pieces. These parts also got a white paint. 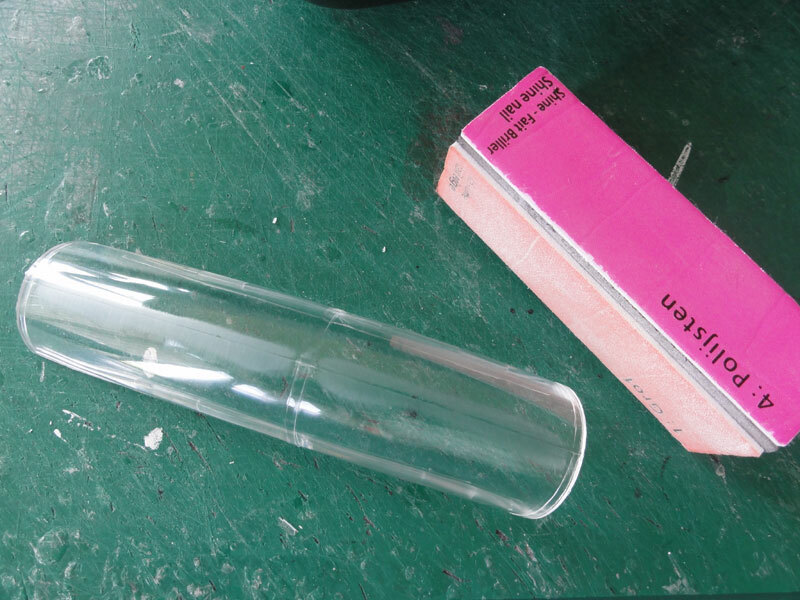 The supplied tyres in the kit are made from rubber, make sure to fit these to their hubs AFTER painting the hubs as the fit is very close and to protect the plastic (from rubber softening fluids). The main gear of STEP 12 is also very nice with adequate detail. Again, only some added detail with hydraulics tubing/wires made from stretched sprue is needed. Airbrush the gear overall white and detail with some paint later on. 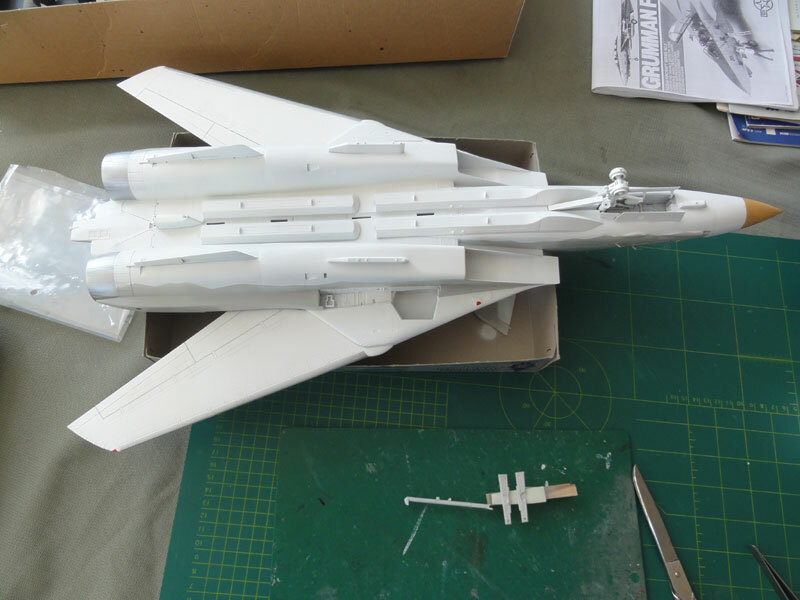 This F-14 Tomcat model is to be fitted with four Hughes AIM-54 Phoenix missiles. Tamiya provides nice fairings for them as well. 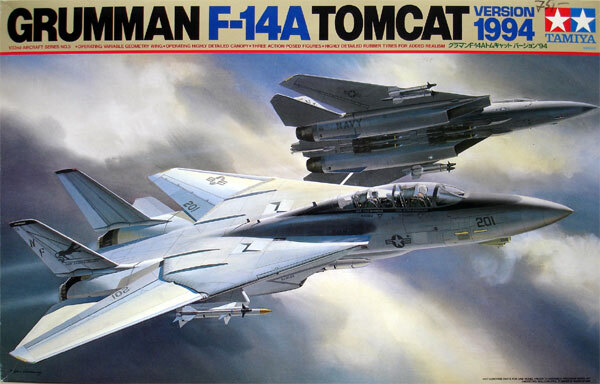 As I had a few missile left-overs also from the newer TRUMPETER F-14D Tomcat, I used 4 of those from that kit. They look better. Please note that Phoenix missiles show different paint schemes during their use, so pick the appropriate one. I opted for overall white Phoenix missiles. Some details were added using black paint. 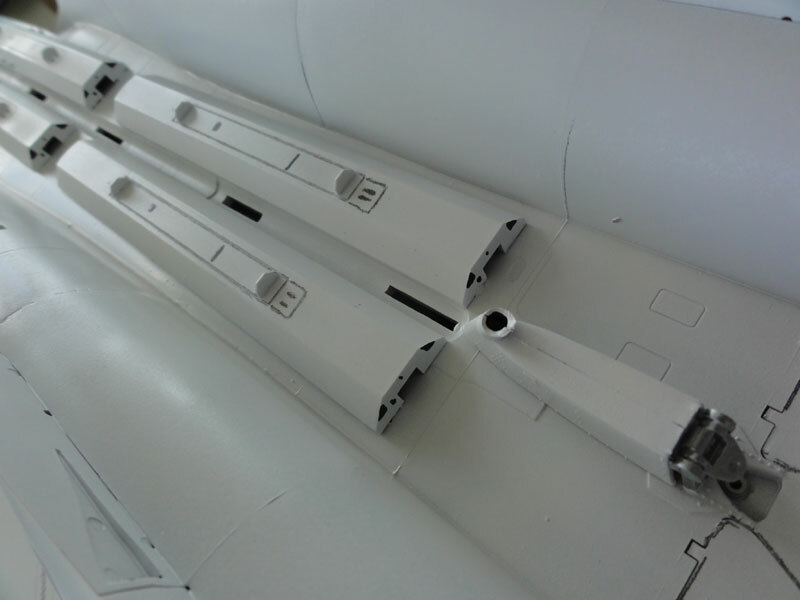 In the spares box I also found an AIM-9 Sidewinder missile with more detail as those in the kit. The better one was used. STEP 19 shows the arrestor hook. Note that first the arrestor hooks were white with black striping, later overall white. 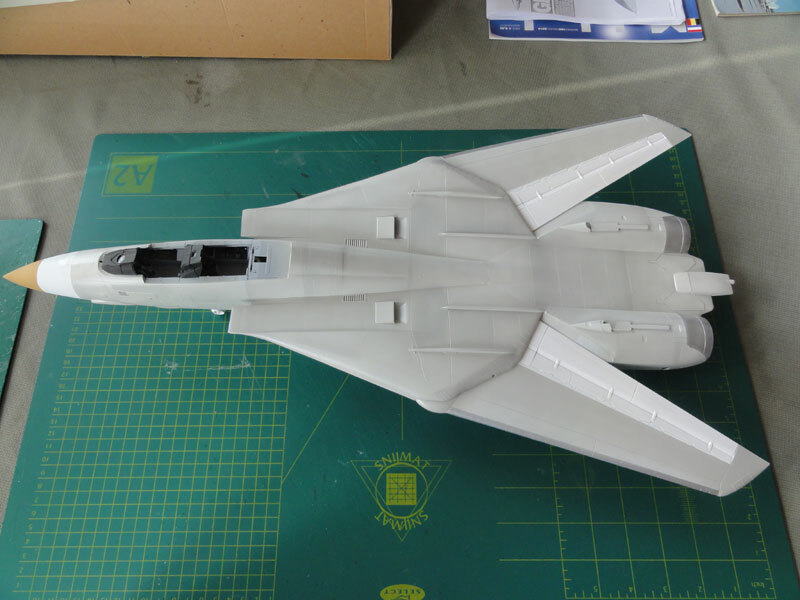 In STEP 20 the vertical tails fit very well. These were LEFT OFF until after further painting to ease handling of this big and heavy 1/32 model.